Update: Samsung announced Gear S2 compatibility is coming iOS later this year. It was just a mention, but it's an exciting development in the often testy relationship between Apple and Samsung. We'll keep you posted on developments. Samsung's latest wearable, the Gear S2, raised the bar for fashionable tech when it released near the end of 2015. Now, it's about to push it even higher. In addition to its regular and Classic stylings, tech fashionistas will be soon able to adopt the Samsung Gear S2 dipped in 18 Karat Rose Gold or coated in Platinum. The Gear S2 isn't the only smartwatch to cater to a crowd that demands a little more luxury out of their tech. The Apple Watch and more recently, the Huawei Watch, have each introduced high-end options to tempt eager adoptees with a large credit limit. So, while this move to include more deluxe options in the Gear S2 lineup is par for the course for flagship devices, we're excited to see one of the best looking watches of 2015 get dolled up even more. 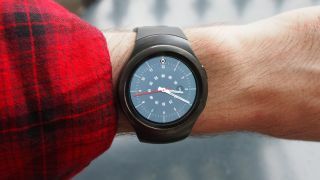 The Samsung Gear S2 launched with support for NFC payments, though Samsung's very own mobile payment system, Samsung Pay, missed its window for release. We received word in late November that the service was officially delayed for the Gear S2 until 2016. Boo! Well, it's now 2016 and Samsung has made good on its time in the spotlight at CES 2016 to confirm that Samsung Pay will be available "early this year" and only to US users. Hey, at least that's a little less vague. Samsung allowed to get our paws on the metal-clad Gear S2 Classic all the way back in September, but the Gear S2 covered in precious metals will be available as early as February. At the time of writing, prices aren't known, but we'll update the article as soon as we hear something.